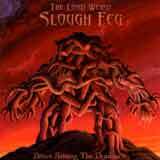 The real name of this band is : The Lord Weird Slough Feg. Luckily, they didn't add other words in this already "long name" and luckily their music is really great. For those of you who are missing first two albums of Iron Maiden (Iron Maiden & Killers), this one is for you. Some of you will think we are not far from copy cat. I don't! It is really "refreshing" too hear this kind of heavy metal nowadays (who said paradox ?). Just listen to first track Sky Chariots and I am sure you will understand what I mean. Even the guitars solos are the reflection of the 80's. With a singer "à la" Paul Di'Anno (intentional or not ? ), I guess you start to understand my words. Add some Manowar old-school elements and now you have the global picture. For my taste it is a killer !!! Of course, I am a mega fan of the first two Maiden's LP. So for those of you who don't know those two records, give a try before. Now ... let's hit again the play button ! When I think I was ..... 13 at that time.